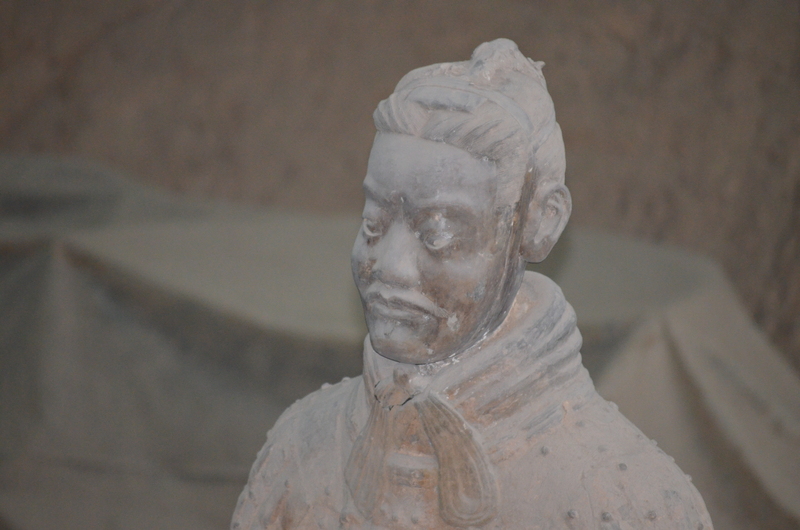 Emperor Qin Shi Huang Di was an intriguing man. Around 220 B.C. he became Emperor, at the age of 13 (Garrett’s age mind you) and he ordered his tomb built, for the day he would leave earth, and become Emperor of another land, after his death, as he believed he deserved. Legend has it that he described a vision of wanting to float away on a sea of mercury under a pyramid as he left earth. Garrett doesn’t even know what he wants for Christmas. In 1974 A.D., while digging a well, local farmers mistakenly stumbled into it. 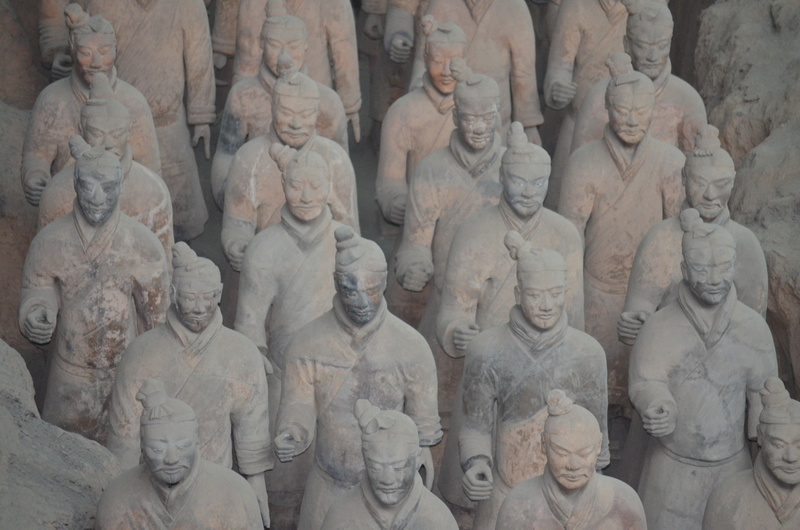 Had they dug a half meter in the wrong direction, there would have been no fall, and the world may not know of the Terracotta Warriors, Qin’s army of thousands. There had been smaller findings before that – pieces of ancient history dug up, manhandled and thrown away as useless, meaningless. But this time, the Chinese government was up for some exploration. Imagine falling into a hole and being greeted by these guys. Turns out, the base of Mount Li, where young Qin chose to be buried, was a geographical mother lode, where jade and gold were abundant and which had perfect, natural feng shui. 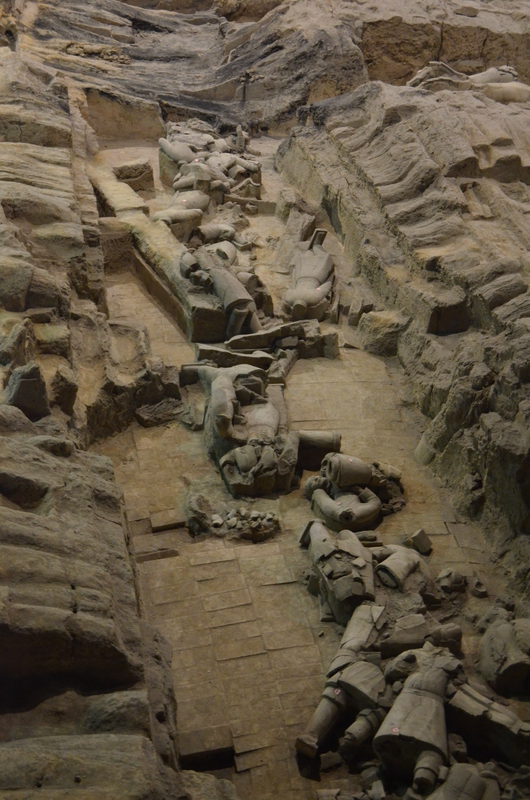 There, still, 16-20 feet beneath the built-up soil, and in most places under caved-in roofing, lies 22,000 square miles of Emperor Qin’s tomb – complete with palaces, towers, chambers, corridors, artifacts, weapons – and over 8,000 warriors and horses made of terracotta — all in precise military formations according to rank. Built to protect him from attack, you know, after his death. And those are just the statues of which scientists are absolutely certain. Some estimate there are tens of thousands more. There are also statues of officials, scribes, acrobats and strongmen, as from a circus troupe. Apparently Qin wished to be entertained in the afterlife. My kind of guy! Interestingly, no concubines have been found, no women at all. But I’m putting my money on the fact that somewhere around those 22,000 square miles is a room or two just full of them. It is a mausoleum both enormous and intricate. It took 700,000 people 36 years to complete the project and it will take decades more to unearth it all. Just to the right, in that divit, is where the farmers dug. I do, I do believe in miracles. I was disappointed, but not surprised, to learn that Emperor Qin was a brutal tyrant. He sacrificed countless lives during his reign; throughout war battles, and for the construction of his numerous projects, and was known to be rigid and cruel. For these reasons, and because China was still in constant civil war, people were always trying to kill him. He was paranoid, but with good reason. Through his tyranny, he united the 7 states of China for the first time in their history, demanding a uniform currency and written language, a standard weight and measurement system, an infrastructure of roads and of course, the construction of the Great Wall which was meant to both keep invaders out, and unify the people within. Which it did. But, you know, the sacrifices evened the scale with the achievements. He was loved by some and hated by others. Even Chairman Mao, the beloved ruler of China until 1976, a man still highly revered, likened himself to Emperor Qin. In a positive way. 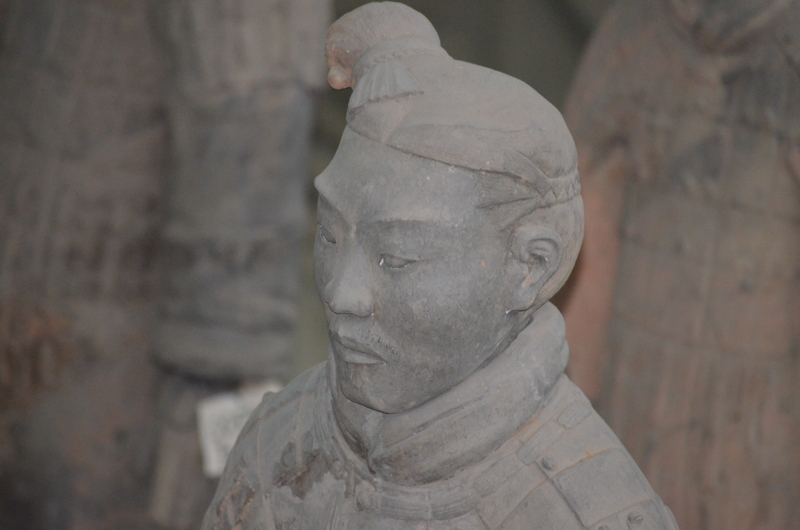 Which speaks volumes about the man for whom the terracotta warriors were created. And it speaks volumes for the traits the Chinese people admire: hard work, determination, ruthless focus. He was feared and detested, but also revered for his accomplishments for his country. Which begs the question: how did anyone ever forget where he lay dead? How and why was that secret kept for thousands of years? 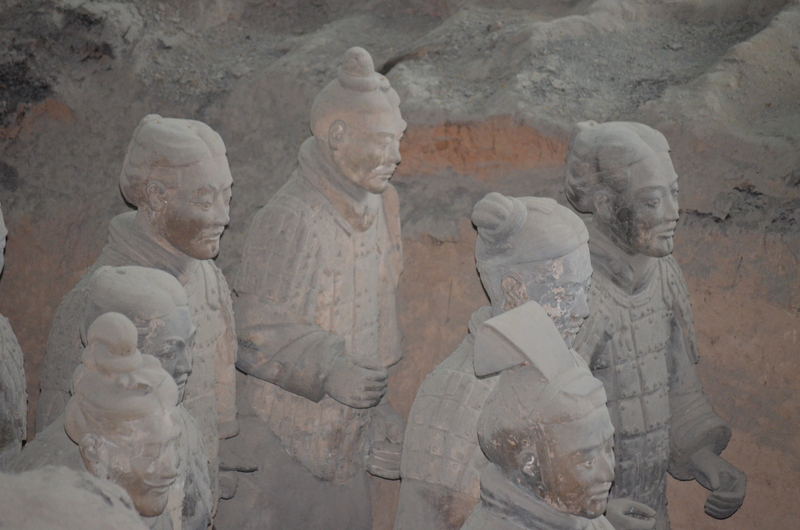 8 molds were used for head shapes, but facial features of ALL the soldiers are unique. He looks pretty ‘together’ doesn’t he? Not one of the warriors was found completely in tact. Some believe the tomb was raided, that invaders smashed the cadets into smithereens and then set the entire place on fire. Others say there is evidence that only nature committed the atrocity of damage that is apparent. Here, I’ll add that most of the weapons that were originally in the hands of the warriors are missing. Mother Nature? The studies continue. In fragments is how most soldiers are found, amid and under tons of rubble, of course. Coffin-like boxes where the men wait to be reassembled. Here you can see how the warriors are pieced together, and how they wait until archeologists find all their bits before putting them back into original stance. 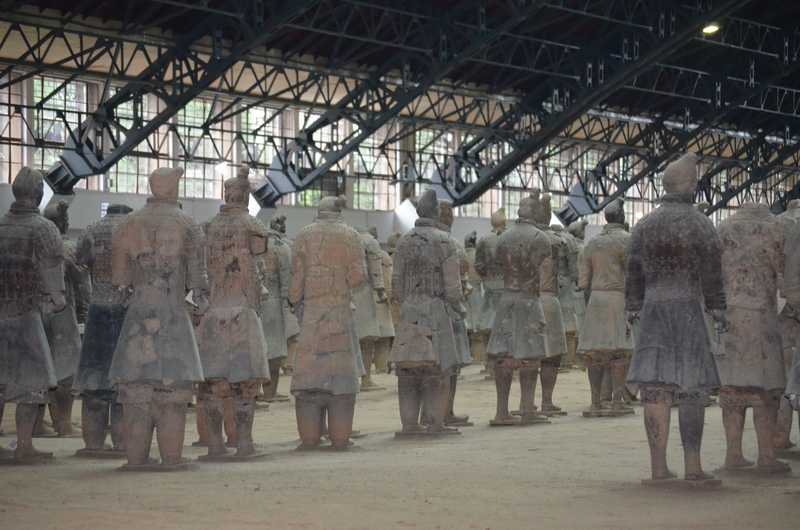 Emperor Qin was a man obsessed with immortality. I’m sure it goes without saying that his enormous catacomb is his effort to achieve such status. If he had been right, if he awakened in another place, he’d have loved his surroundings. His actual tomb remains untouched. First, the government claims that no one knows exactly where it is (say what?!). Second, the paint used to beautify all the pieces, when exposed to oxygen, fades within 15 seconds and peels away within 4 minutes. And that just won’t do. I thought the warriors were astounding. Then I learned that originally, they were dressed in bright blues, purples, yellows, and reds – of which you can see a bit here. Look at the elaborateness of his braids! This is an archer, by the way, sans arrow. The only way to ensure the preservation of what is still underground, is to explore it while inside an airtight tent…and the one company in the world that makes them does not make them big enough. So the world waits. And according to Chinese officials, it is possible even the children of our children’s children will wait. It’s not like there’s not enough to do in the meantime. I mean really. 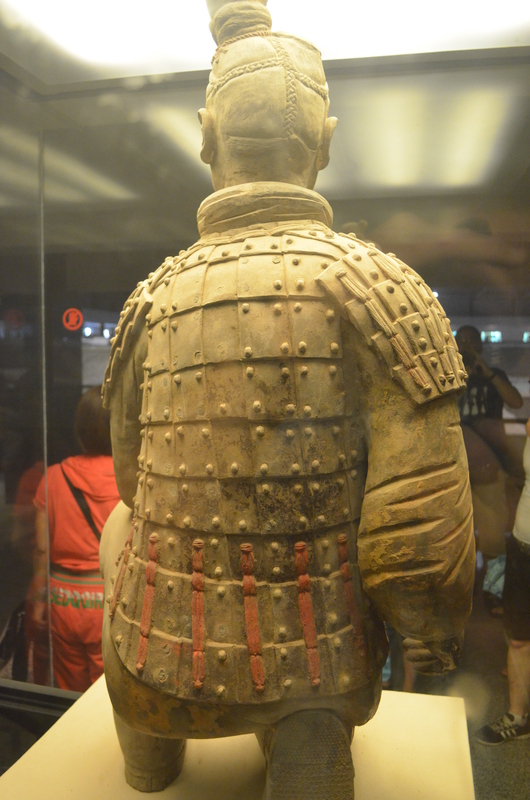 Qin’s tomb is, however, described by historians, beginning in 246 B.C. (which is bewildering in and of itself) — as being beneath a pyramid structure and inlaid with pearls and other precious stones, along the entire ceiling, mapping out constellations. The floor is a series of “rivers” in mercury, mapping out the myriad waterways that permeate China. 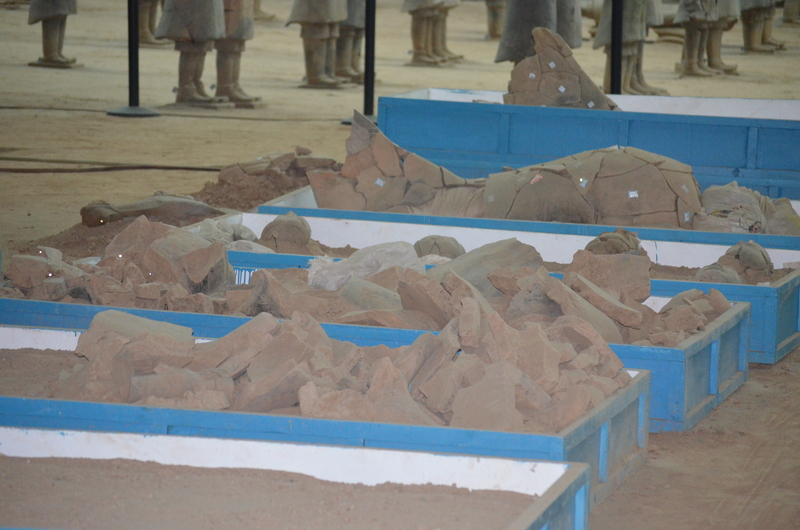 Whale fat candles line the walls, and were burned as long as possible after Qin’s death, during the time in which his son took over the throne. So his vision had been realized. I ask again, with actual surviving documents and gazillions of Chinese descendants still inhabiting the Qin province, how did it come to be that while digging up a well, every single one of them went Holy crap, Batman, where’d THAT come from? I’m telling you, from the concept to the details, this place is surreal. What scared everybody so much that it was hidden away? Eventually forgotten? Writing about it, thinking about it, imagining its construction and eventual destruction, and now its resurrection…it astounds me. This place is like nothing else in existence. Anywhere. In this, Emperor Qin did achieve immortality, after all. 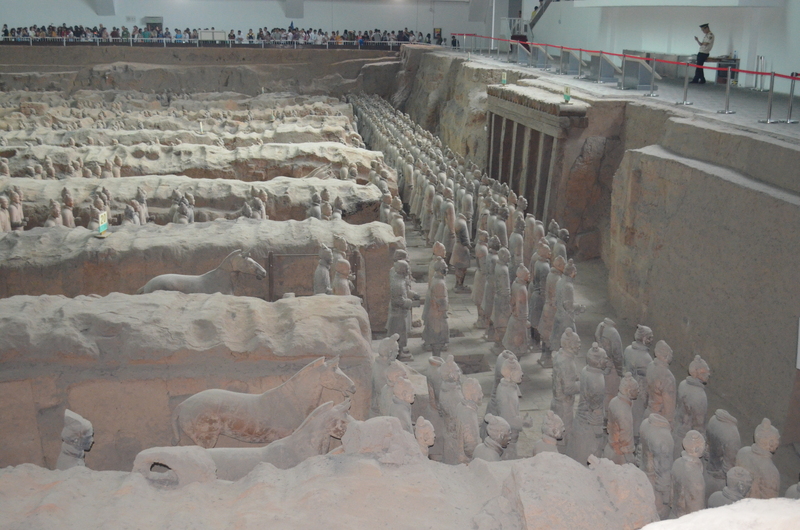 His little project still employs thousands of people 2,000 years after his passing and will bring millions of tourists to China yearly to see it. The vastness of it means the mystery will unfold over centuries. And I look forward to learning more. What an absolutely fascinating story!